Note: I do not fully endorse the use of hypnosis to bend people to your will. Not fully. But what practical good is it if you can’t bend them a little, if it’s something harmless, something beneficial to yourself, and something they would likely do in their normal consciousness if you wasted the time and effort to convince them with wheedling and reason? Do I have a Hypno-Coin? 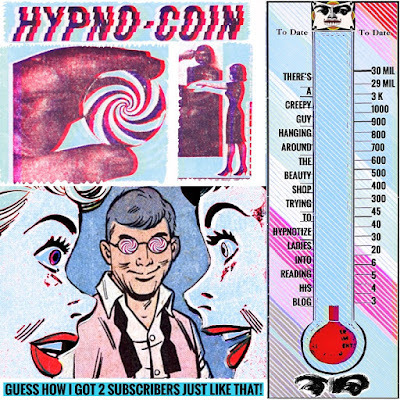 Did I ever have a Hypno-Coin. 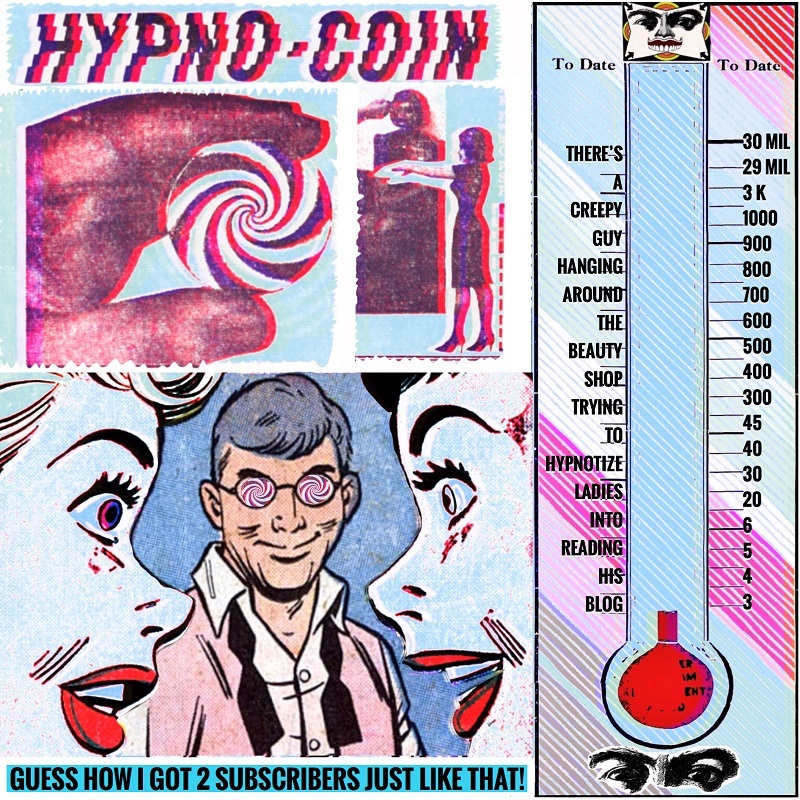 I do not have a Hypno-Coin now, not at the present moment. It’s gone, being held for evidence. My only hope is that the little plastic overlay, which doesn’t have a flat surface but grooves that gives it its distinctive hypno flavor and look, will not yield good prints. Meaning that if the ladies follow through on their threats to sue the pants off me, it’ll be their word against mine. And who would anyone believe, a guy smart enough to hypnotize people with a cheap toy “coin” (It’s not a coin, just a circle) or two dizzy girls up all night after a slumber party and a bender at that. Under those conditions I could’ve yelled at them from the spire of the courthouse and they’d have been hypnotized. Full disclosure on what I did: They were going to run away with nasty boys. I flipped out a Hypno-Coin and persuaded them -- only reinforcing their deeply-held sense of right and wrong -- to go back home and live happily ever after. But I can see how people might be suspicious, an old man on top of the courthouse with a Hypno-Coin. 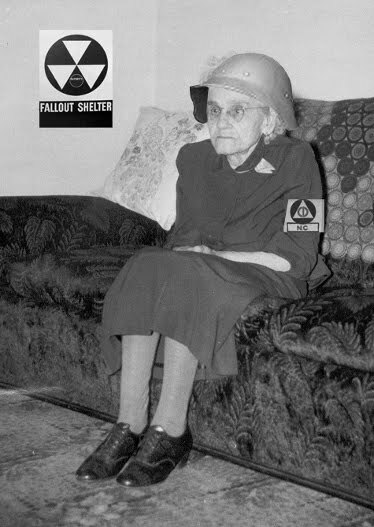 We hear of nasty stuff all the time. Pictures in your yearbook, being drunk and out of control, wild and crazy guys. Sure, I have secrets, but nothing too bad. But I have a reputation to keep. Ashes to ashes, dust to dust, tell my secrets, you know I must ... not. Ha ha, the funny part is ME with SECRETS. What could I possibly have done? Make the list. I’ve been a church mouse, and what happens in church stays in church. In the secure confines of the confessional: “Father, I have sinned ... 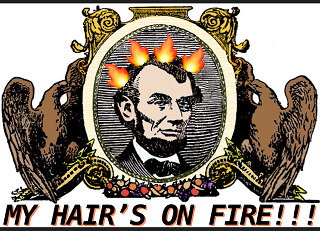 Seriously, it's all quite benign." I’d never want relationships or subscribers from some weird hypnosis, drawn away from their own clear and respected will. There’d be no point, because it'd be all me. The result is bad. “I waved a coin in front of this person and got a subscriber for life.” That’d be meaningless. The only ones I want are those who willingly choose, then cut thickets away with machetes, then crawl over broken glass, then raise their hand and without force, say those tender words: “I swear on my life to read your blog everyday, to meld my mind with it and follow its benevolent dictates, to distribute its teachings, and to insinuate myself, without force or coercion, into the lives of others, that someday of their own free will, they too would be in your thrall.” Then we bandage their knees and I'm suddenly out 40 bucks for a new pair of pants. Hit those thermometers! Very nice. Our minds ... now ... slowly ... and with your own will remaining ... do part.